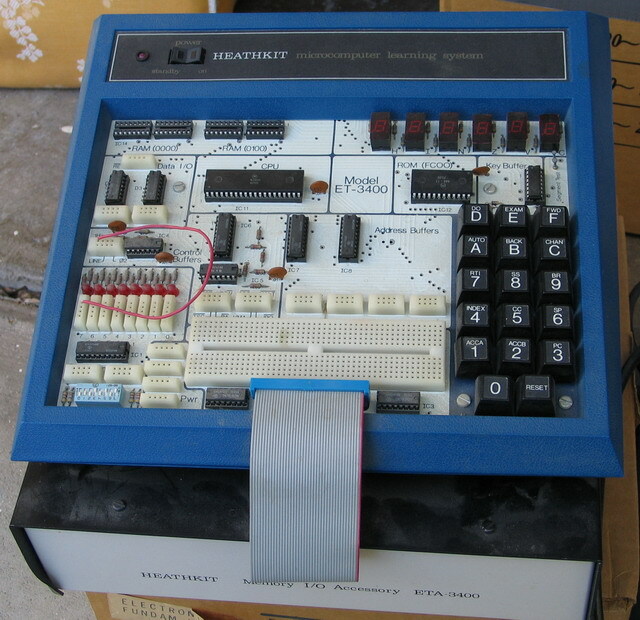 In the late 1970s, perhaps early 80s too, Radio Shack sold a sort of computer trainer kit. It had a hex keyboard and its output was primarily through a grid of LEDs on a raised stand. I seem to recall this was also sold through other companies. Does anyone recall this? My google-fu is failing me. the base was white and had a hex keypad. I believe it also had one or two 7-segment LED displays. on top of the two cylinders was the "display area". among other things, in the center was a grid of conventional red LED lights, 4x4 IIRC, or perhaps 3x3. I recall playing a pong-like game on on the LED grid. It had a known bug that would sometimes lead to it looping the ball between two positions forever. which had a TMS1100 as the processor (if not there is the digital computer kit on the previous catalog page but I don't think that matches your description). The other options I can think of might be the MZ-40K from sharp, Micro-Professor MPF-1 or one of lots of other single board computers. Perhaps you are referring to the Heathkit ET-3400 microcomputer. It has the hex pad, the line of LEDs on the left, and a few 7 segment displays. I don't see anything green, though. Many Radio Shack stores were privately owned franchises, where they would carry additional items other than the standard Radio Shack fare (often TV repair shops). You may have seen a Heathkit/Zenith item in a store like this. Not the answer you're looking for? Browse other questions tagged identify-this-computer radio-shack or ask your own question. What kind of keyboard or computer am I typing on?